In a precedent-setting ruling that has national and international implications, Ontario Superior Court Justice Carole Brown has ruled that three separate lawsuits against the Canadian mining company HudBay Minerals can proceed to trial even though the plaintiffs are from another country. “As a result of this ruling, Canadian mining corporations can no longer hide behind their legal corporate structure to abdicate responsibility for human rights abuses that take place at foreign mines under their control at various locations throughout the world,” said Murray Klippenstein, of Toronto’s Klippensteins, Barristers & Solicitors, who’s representing 13 Maya Qeqchi from El Estor, Izabal, Guatemala. The Maya Qeqchi turned to Canada’s court system over three separate injustices that were carried out by employees of the Fenix Mining Project, a nickel mine that was acquired by HudBay Minerals after the company purchased Skye Resources in 2008. In January 2007, Skye Resources (subsequently renamed HMI Nickel) requested the eviction of five Maya Qeqchi communities from their ancestral lands. At the time, the Fenix project was subject to land claims by the local communities, who maintained that Guatemala breached international law by approving the mining concession because it failed to carry out prior consultations. As if it wasn’t enough to displace the Maya Qeqchi families, on January 17, 2007, 11 women from the community of Lote Ocho were gang raped by the police, military and security personnel. The second lawsuit against Hudbay is led by Angelica Choc, the widow of Adolfo Ich Chaman. 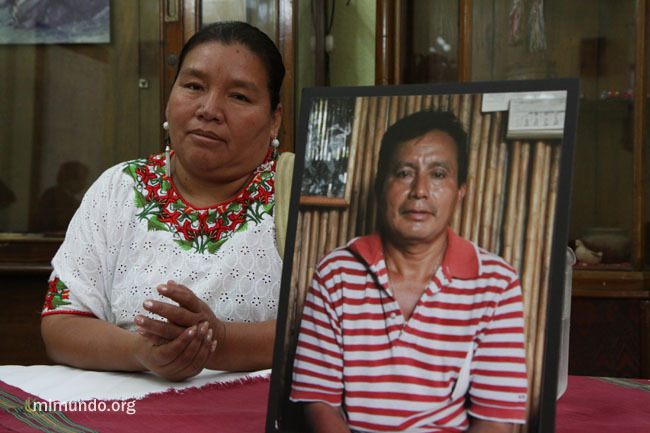 A respected community leader, a school teacher and father, Adolfo was brutally murdered by the company’s mine security. Their son, José, who witnessed the killing, says the security guards hacked at Adolfo with a machete before shooting him in the head. Adolfo was trying to help restore calm in the region after hearing gunshots from the direction of the company’s buildings. A third lawsuit was filed for German Chub, a young father who was shot at close range by the head of the security personnel the very same day that Adolfo was murdered. As a result of the injuries that he sustained, German Chub was paralyzed and no longer has use of his right lung.